Ethnic identity of the Lemki is somewhat controverted. Ukrainians consider them to be a branch of the Ukrainian Nation with very distinct dialects and customs. The Polish have at various times tried to alternatively suppress, cleanse, or assimilate them. Some insist on calling them Carpatho-Russians. Some claim that they form a micro-nationality who call themselves Rusyny, usually translated into English as Ruthenian. You will find individual Lemki who identify with each of these camps. 'Lemko' is a tern coined by their neighbors, referring to a word used in the Lemko dialect 'lem', which Ukrainians and Poles do not use. Some Lemki have accepted this term. This term is not used by the Rusnaks who live south of the Carpathians or by the neighboring Slovaks. In any case, they form a distinctive group of people with a distinctive group of dialects, whether they are considered to be a branch of the Ukrainians or a closely related brother nation. 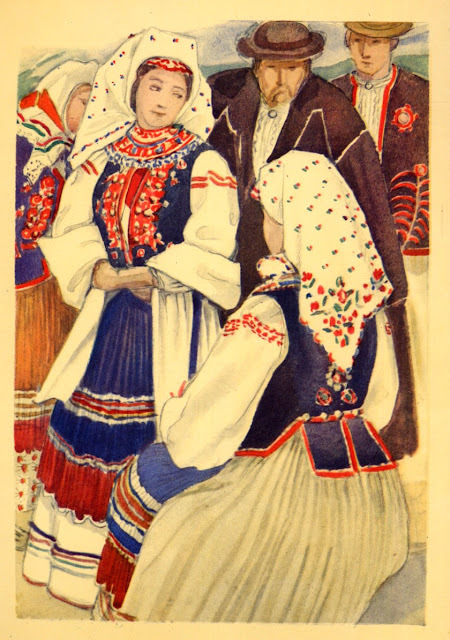 The painting at the top of the article was made by O. Kul'chytska, an artist who went around in the 1930's painting the traditional clothing of villagers in many parts of West Ukraine. Her work has been invaluable for those of us who came after. He has asked me to point out that these were made for the stage and real costumes would be somewhat more subdued. Here is a flicker page showing various Lemko garments. Thank you for this post. I'd like to add that there's a private museum of Lemko costumes in Komańcza, so if anybody is going to Bieszczady mountains, it's worth to see. This is a beautiful piece. I commend you for it. I am an American of Ukrainian descent and can certainly appreciate this. My parents emigrated to the US after World War II. I own a lot of embroidery that I inherited from my mother and her mother. This is really and truly Ukrainian art. I also have an aunt that is a Ukrainian embroidery expert that verifies that this in indeed Ukrainian art. Unfortunately as you mentioned, the Ukrainian population was forcefully moved from their homeland, including Komancha, and other nationalities were brought in. Thus the confusion of the nationality of the people.